I've been working on this project on and off for about 5 years now - some of you might remember my journal about Thor, which I had to abandon due to an unstable code base. I started work on Sledge about 2 years ago, and it only contains very small portions of the original Thor code. The current Sledge release is an alpha release, which means that there are still some key features that need to be added and the features that are there may be unstable at times. However I think that right now it's at a point where people can start trying it out to see what they think (and hopefully report some bugs! ). Once the missing features are added, then I will start on Source support for version 2. Right now, it only works with Goldsource. That download link again is: sledge-editor.com. Crashes on startup... don't know why. It might be my antivirus. Rim: How far does it get before it crashes? Do you get any sort of crash information after the crash or in your Windows event log? Can you try running it as admin to see if that's the cause? Crash for me too, error report sent. should i reinstall .net 4? (when i went to install it, it asked if i wanted to remove/repair the current install, so i thought it was good. OOPS error occurs immediatley at startup. Thereafter, it shows the visgroup/texture bars on the right, but nothing else is showing up. So what kind of features are we looking at with this one that Hammer cannot do? Other than the open source bit. Ok, looks like running as administrator is the work-around for now. I will work on trying to get it to prompt for the proper credentials so it works nice with UAC. Those are just some ideas, there are plenty more possibilities. Goldsource (and eventually Source) will always be first-class citizens, I wont ditch improvements for Goldsource once Source support is added. So far so good. A few errors popped out on the settings tabs, but nothing that crashed the program. As Captain T said, space + click movement is missing. That is a really good feature. Also, zoom out limit, i can zoom out off to another dimension. As well as zoom in. Once an object is out of the 2D screen view it can not be selected. 2D screen does not move when you try to stretch the brush you're creating. You need to unzoom first. Delete button doesn't do anything lol. For the delete key not working: I've gotten that before, the hotkeys seem to stop working sometimes. Close and re-open the map, that usually fixes it. Damn guy, you're good with C#. How do you know all this stuff, specifically all the 3D stuff? If you're so good, you shouldn't have much trouble designing your own built-in compiler and have that replace Compilator 3, because, and let me be honest with you, the current version of C3 isn't that optimized and contains messy code here and there. One suggested to implement C3 in Sledge, but I don't know if that's a good idea. Maybe later. I'm planning to rebuild C3 in C# this time, as I've been using VB.Net up until now. Is it possible that you could release your C# version of Compilator under a GPL compatible license when you get around to doing it? I think that I could merge it into Sledge's code base, it would save me a lot of work Regardless of what you plan on doing, hit me up if you have any questions about C# or Sledge's programming. I would love if you wanted to contribute to the Sledge code base! Is it possible that you could release your C# version of Compilator under a GPL compatible license when you get around to doing it? I've been saying this for a long time, but I really want to release my current built (Compilator 3 Version 3.0.0.00, Beta 1.0) to the public even though the application isn't perfect. I guess that's why there are beta's, eh? While people are toying with it, I want to move on the Compilator 4 (working title?) and move to C#. Its very interesting to hear that C# is a great platform for windows programming. I am learning it at my College and am experimenting at home as well. I suggested to implement C3 into sledge, it would be really nice to have all that ease of use in such a program. I can't recall if I have .NET 4.0 installed, or it's 3.0, but either way I'm going to try it out. If it doesn't run I'll assume it's because I don't have 4.0. If it runs and crashes, I'll be sure to report. Thrilled to bits that this has made it to alpha! I'ma repost a PM I sent you years ago, though, because I still think it'd be a great addition! Mocked this up quickly to demonstrate a couple of ideas I had for the face editor. Firstly a random shift function which works with the "treat as one" tickybox. It would allow you to quickly randomize, for example, a set of stairs so that they don't so obviously tile on the X plane. Secondly, something gtkRadient has which always amazed me wasn't implemented in Hammer 4 - a tiling fit option so that you can fit, say, 4 tiles of a texture to a face rather than just stretching it to 1, untiled fit. This is extremely useful. Whoa that is so cool Archie! Edit 2.0: Been working on fixes, but now it's time for bed. I'll put an update out tomorrow that should stop those errors in the settings window, plus add spacebar+drag movement and drag-scrolling into the 2D window. @Stojke: Could you please clarify this bug? I'm not sure what it means: "Once an object is out of the 2D screen view it can not be selected." NEAT. Got to try it out. Hey all, I've fixed most of the bugs and missing features that you guys have reported. Just start the app and it should ask you to do an update. If the updater screws up just download the installer from the website and reinstall. Let me know how you go! Set parent properly when creating a brush group. Fixes #15. 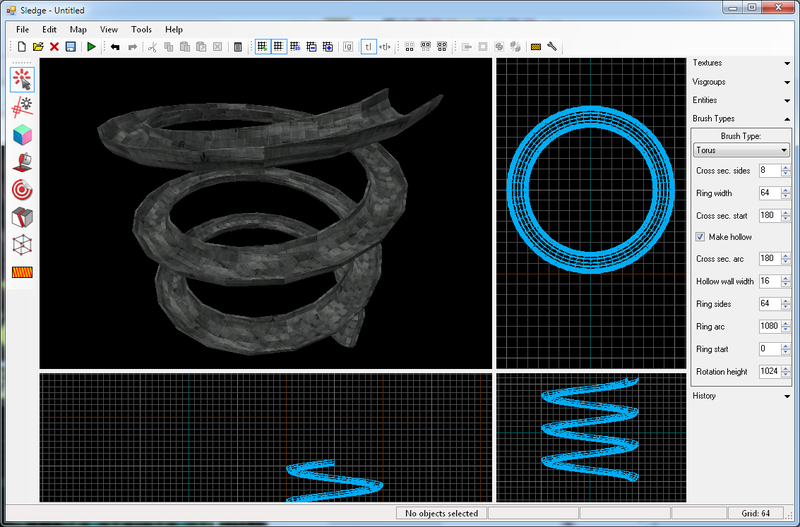 Torus tool was generating invalid solids. Fixes #7. Only clip valid solids. Fixes #6. Include manifest file to request admin access on start. Fixes #3. This is so cool! Here are my first initial thoughts. How do I move the 3D camera (Shift + C) in hammer? After dragging out a brush, do I have to click enter? That is slightly annoying. In the corner of the view ports it'd be nice to see top, front, side etc. Any chance that there will be a binaries only download? Thanks Kraken. To move the 3D camera, hit Z to go into freelook mode and use WASD. I'll probably add in the other camera controls in the 3D views soon (left click = look, right click = move around, etc) so people who use those controls instead of free look can use controls they are comfortable with. Stu: Yes. Every release also has a standalone zip for those who don't want an installer. Download the latest version from the GitHub release page. Great! I tend to prefer things that don't require an installation program. I'm sure you're a safe source, but I've grown to dislike them lately. Yeah my crash was like Cap'n Terror's. Need to check it out later. I could suggest a bunch more tools that would be fundamentally helpful but I haven't seen it yet so I'll wait to write stuff about it. Grid doesn't show up on mine, then again, I have Radeon graphics. Using the VM tool, you can't select a brush by clicking it in any of the view ports. First thing I noticed. There is no auto-enter for selection, you have to draw your selection and hit enter to select. Hammer had the option to automate is a little. I use it a lot though its preferential. I have no idea how to load textures. Suggestions: Nothing major, but if you're going to have a fine level of decimal coords for brushwork, a weld, target weld, or vert-collapse to single point would be useful in unifying geometry and all that. I submitted the error but I still can't use it. Wait, it's not a crash. It only doesn't make a new map. I'm stuck. Stu: Looks like your graphics card might not support OpenGL 3.3, what GPU are you using? Are you on a laptop? I might be able to downgrade the shader version with a few changes, I will need to investigate. The easiest fix is if it is possible for you to update your drivers to a version that supports OpenGL 3.3 which has been supported in drivers since about 2010. Rim: Did you check that 'show 2D grid' was turned on? I don't have a Radeon graphics card to test, does anybody else with an ATI card have a missing grid? uac prompt everytime i open still; should i reinstall as administrator? 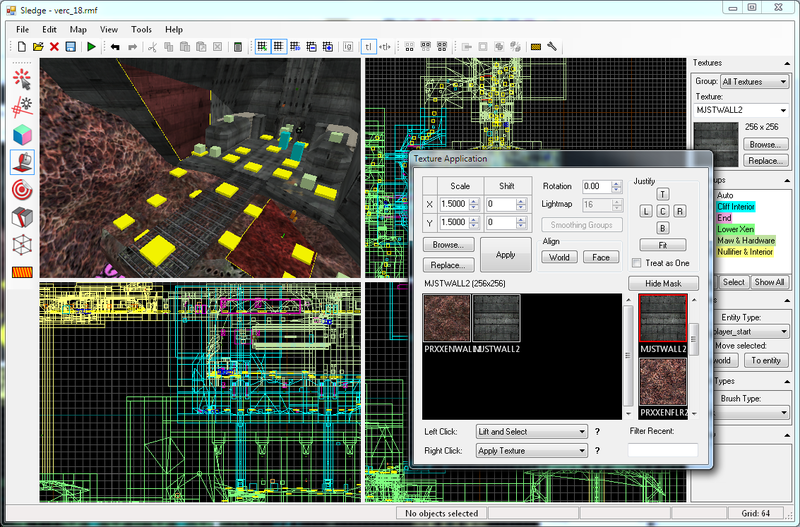 Yeah, the settings are a bit more refined than Hammer 3 - textures are set up at the game level rather than globally. For the UAC stuff - I can move the settings into the AppConfig folder instead of keeping it in program files, this should allow me to turn off the prompt. I'm on a laptop indeed and it's less than a year old. It has an Intel HD Graphics 3000 graphics chip, whatever that is. It runs most games pretty well. Also too, i love that the texture properties shows you multiple faces if you've selected an object with multiple textures, neat! CapT: I've been undecided about the handles for a long time. On complex maps, they really do add a lot of clutter and make it hard to see anything. I'm not sure what to do about them. Interesting issue with that rocket map, I will see if I can locate the cause. No hurries, I'm not actually making any maps right now. I'm looking forward to, though. Aren't the handles optional in Hammer? You could have the option of turning them on or off. I think that it's also optional to be allowed to select brushes by their edges instead of their centre handles only. I don't think handles are optional in Hammer, but they would be if I added them in. But I want to find a way to do the handles better, so even when they're turned on they don't clutter up the 2D view so much. And yeah, selecting stuff by the handles or edges will have settings as well. @CapT: I found the issue in that map, it's because the skybox is hidden with a visgroup. I'm not hiding visgrouped objects properly on load, so I need to fix that. Edit: New release! Just start the program to do the auto-update or download it manually and do it that way. Add "toggle ignore grouping" hotkey. Fixes #20. Check that a solid entity exists before tying to entity. Fixes #24. Added hotkeys to switch between tools. Fixes #28. Added arrow key nudging, and some icons updated. Fixes #21. RMF implementation was generating invalid files. Fixes #31. VMF was saving the Auto visgroup to the disk. Fixes #33. Hide children if their parents are visgroup hidden. Fixes #30. Update to 0.1.0.5 - fixes #27. What about instances? If you've got this far, I'm sure implementing instances shouldn't be that hard. Edit: New release! I added a bunch of options that were missing, including the options for the center handles and automatic selection. Looking forward to hearing people's thoughts! As usual, start the program to auto-update or download it manually from the website if you want. Omg why have i not seen this yet!? This is my number one to-do tomorrow! Nope, still crashing on File > New. Make the Options window start at the centre of the screen (it's just a flag in VS). It ends up out of the screen if you're on a low resolution. @Stu: No worries on the options window, will do. For the crash window, just expand the window to see more of the error. I'll add a scroll bar as well, though. It's resizable?? Didn't even notice that! I'll check it out in the morning. I've done you a favour Penguin and mentioned on Facepunch. 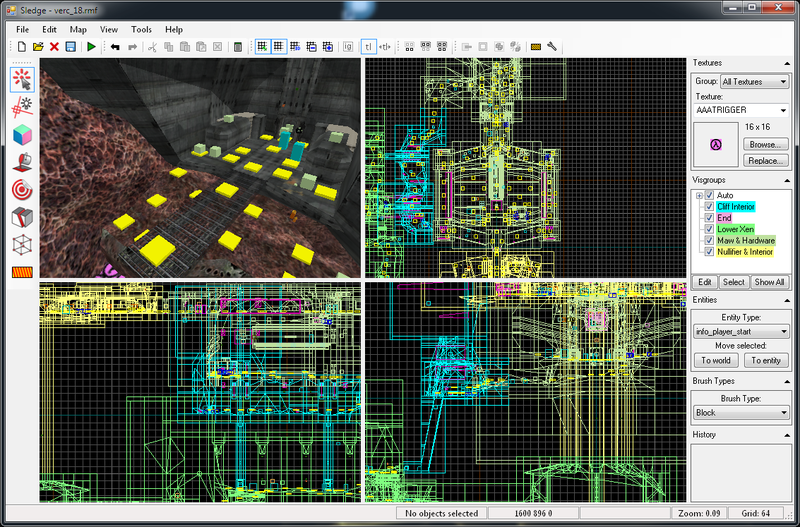 I know you guys think it's a cesspit of filth (which it is) but some of the mappers there are pretty talented people. It's gathering quite a lot of interest there. Can you set up Sledge to canabalize/borrow config settings and preferances from an existing hammer setup(if there is one), to make the setup basically automatic? A screen shot utility(i know someone here coded one already, but i can't remember who), for quicker easier in-dev shots. In fact, maybe you could do something like Archie did with the preset cameras, for those sweet time lapses he did for The Core? Thanks Instant, could you post a link to the thread so I can keep track of any bug reports? Thanks, I'll keep track of it just in case anybody on there has some feedback. I got through to the new map, at last. Love the clip tool on steroids. But there is something that, just like in hammer, I don't quite get. Using the mouse scroll wheel to zoom in/out zooms in/out by strange amounts. It's not just 1.0/1.25/1.5/2.0 or 1.0/0.75/0.5/0.25/0.1, instead the progression is 1.0/1.20/1.44/1.73/2.07 and 1.00/0.83/0.69/0.58/0.48 and so on. What is the logic behind this progression? Because I can't make any sense out of it. Like Rim, I can't see the grid. I double checked it was turned on in the Map menu, but it's still not there. 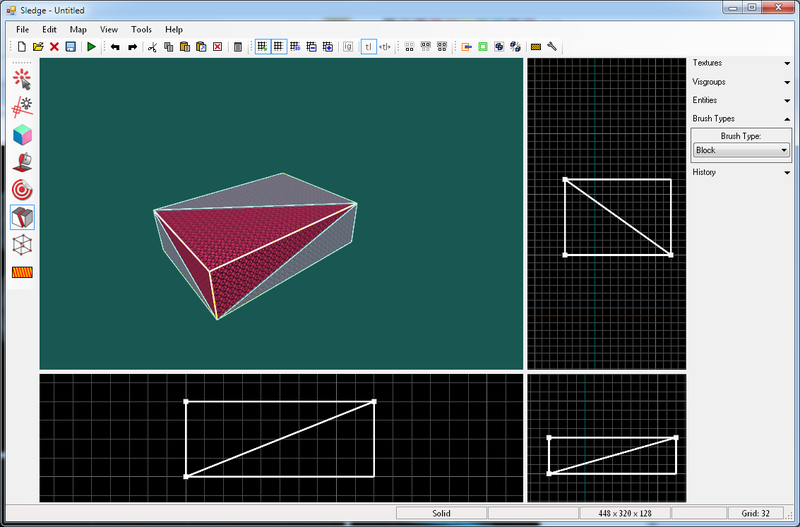 Neither 2D grid nor 3D grid. Seems I can't see the Cordon either. Visual detail: Selection handles aren't always an X. Sometimes they seem to be a pixel or two short, the asymmetry really hurts my OCD. Processed in a respectable shabby 44 milliseconds.